San Francisco – The Golden Gate Salmon Association (GGSA) will host its fifth annual Sonoma Salmon Dinner on Friday, Nov. 9 at Ramekins Culinary Institute. The dinner will honor Sonoma County Water Agency’s General Manager, Grant Davis while raising funds to support GGSA’s work restoring salmon. The event will be held at Ramekins Culinary Institute, 450 West Spain St, Sonoma. This year’s event is on the heels of the enormous success of last year’s dinner where over $60,000 was raised with half of it going to local fire relief efforts. Doors open at 5:30 p.m. and tickets are $125.00 per seat or $1250 for reserved tables of 10. Tickets are available by calling 855-251-GGSA (4472) or by visiting https://sonoma-salmon-celebration.eventbrite.com or www.goldengatesalmon.org. The night will feature fresh-caught salmon prepared on the fire pit. Ted Wilson of and Kyle Kuklewski, of Ramekins will come together to elevate the culinary treats of the evening. Fresh oysters will be provided by Drakes Bay Oyster Company. Live auction bidders can compete for trips including ocean fishing, an overnight and boat at Caples Lake Resort in the high sierras, Mendocino stay, PlumpJack Squaw Valley overnight and dinner plus other exciting wine lots and fun. The night will also feature wines, cocktails, silent and open auctions, and the chance to compare fall harvest stories while raising funds to support GGSA’s work to keep abundant salmon stocks in California. 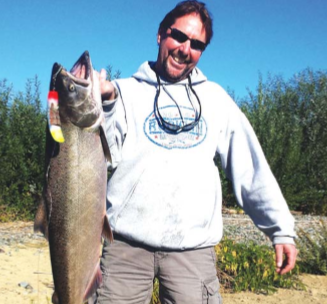 Attendees will get a brief update from GGSA on the current state of salmon affairs. The Golden Gate Salmon Association (goldengatesalmonassociation.org) is a coalition of salmon advocates that includes commercial and recreational salmon fishermen, businesses, restaurants, a native tribe, environmentalists, elected officials, families and communities that rely on salmon. The Golden Gate Salmon Association (www.goldengatesalmonassociation.org) is a coalition of salmon advocates that includes commercial and recreational salmon fisherman, businesses, restaurants, a native tribe, environmentalists, elected officials, families and communities that rely on salmon. GGSA’s mission is to restore California’s largest salmon runs in the Central Valley rivers because they provide the bulk of salmon caught off our coast and inland rivers. We serve the sport and commercial anglers that rely on salmon as a long-term, sustainable resource. Salmon recovery is our passion.